Stanford's 2015-16 season kicked off at famed Olympia Fields CC outside of Chicago in a field stocked with top teams from around the country. 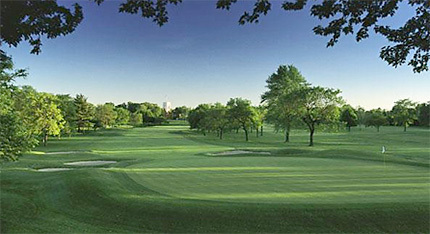 Olympia Fields hosted this year's US Amateur and in past years has hosted The PGA, US Open and US Senior Open. State. Maverick McNealy, however, started the final round with a 5 shot lead in the individual competition and with a 71 (67-65-71 203 1st) finished in first place for his 7th career win. McNealy, the 2015 Division I Player of the Year and ranked No. 1 last week among college players by Golfweek, finished 3 strokes ahead of Illinois' Thomas Detry. Last season, McNealy shared medalist honors at Olympia Fields and wound up winning an NCAA-best six tournaments. Viraat Badhwar had a solid tournament finishing tied for 16th (71-72-71 214), David Boote tied for 27th (71-73-74 218), Franklin Huang tied for 38th (72-74-75 221) and Bradley Knox tied for 64th (75-77-75 227). The Cardinal moved into the lead by two strokes over two teams (OSU & FSU) as Maverick McNealy surged 5 shots ahead in the individual competition with a brilliant 5-under 65 (67-65 132). Maverick's round included 6 birdies and a hole in one eagle on the 15th as he had nines of 34-31. Viraat Badhwar had a 72 (71-72 143 T15), David Boote a 73 (71-73 144 T23), Franklin Huang a 74 (72-74 146 T31) and Bradley Knox a 77 (75-77 152 T64). Scorecards and top 9 teams scoring is shown below -- click on the image to enlarge. Stanford is in 2nd place after round 1, 8 strokes behind Florida State at a 1-over 281 total. Maverick McNealy is in 3rd overall with a 67 on a round with no bogies, followed by David Boote and Viraat Badhwar each with 71 (T22), Franklin Huang at 72 (T27) and Bradley Knox at 75 (T52). See individual scorecards and top 10 team scores below --- click on image to enlarge.